I can’t believe how much I enjoyed the new Twenty One Pilots album. The last few years have been a little rocky for the band. While I’m sure everyone can agree “Stressed Out” was far too overplayed, it’s still undeniably a good song. Nevertheless, the band is back with another album full of hits. Twenty One Pilots is an alternative rock duo composed of Josh Dun, the drummer, and Tyler Joseph, who does everything else. Joseph is the pianist, lyricist, and vocalist, among other essential parts to the band. Trench is their fifth studio album and their first record after a three-year hiatus post-Blurryface, their last (very successful) album. Chronologically, their released albums are titled: Twenty One Pilots, Regional at Best, Vessel, Blurryface, and now Trench. The singles off the album are “Jumpsuit”, “Nico and the Niners”, “Levitate”, and “My Blood”. Trench is a concept album set in the fictional city of Dema and the surrounding valley called Trench. The album’s themes are those recurrent in works by Twenty One Pilots—insecurities, faith, and mental illness. Commonly, bands debut their sound with their major-label debut album (in this case, Vessel). However, with the release of Trench, Vessel now seems like the most distinct sound they’ve had. Noticeably on Trench, their sound has clearly developed, yet it also sounds much like their oldest albums, unlike Vessel or Blurryface. 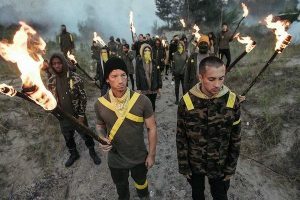 While Vessel and Blurryface were the band’s first trials in more produced, electronic sounds, Trench brings back a lot of the casual, piano sound from their self-titled and Regional at Best albums, with tracks such as “Neon Gravestones”, a song highlighting the negative impact of romanticizing suicide. The sound in their new album is thankfully a lot less melodramatic than in their last one. Joseph rarely delves into romantic songs that sound romantic. For example, he plays with juxtaposition in the song “Smithereens”, a song dedicated to his wife, Jenna, proclaiming that he would get beaten to smithereens for her—similar to his previous song for Jenna, “Tear In My Heart”. The entire vibe of Trench is very groovy but switches up the rhythm with the occasional fast-paced track. Boasting a casual sound and meaningful lyrics, Trench is the kind of album you can listen to whenever and wherever you happen to be.